Brianna earned her Doctorate of Physical Therapy and Bachelors of Rehabilitation Science degree both from Northeastern University with a concentration in Sports, Strength and Conditioning. Originally from Revere, MA Brianna was a two-sport varsity athlete in soccer and softball. During her studies at Northeastern Brianna played on the Club Softball Team and was a Cycle Instructor for Northeastern Group Fitness. She has completed clinical rotations in Cape Cod, Boston and San Diego, two of which have focused on treating orthopedic conditions in an outpatient/sports rehabilitation setting. 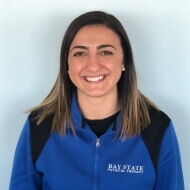 Due to her lifetime participation in sports, Brianna has developed a strong interest in working with the athletic population, especially patients recovering from hip and knee injuries. Brianna enjoys working closely with her patients to create an individualized, goal-driven plan of care. She recognizes the importance of providing adequate education in order to increase her patient’s involvement throughout the rehab process. She believes in promoting a fun, creative and function driven atmosphere to help get her patients back to doing what they love.